It's been a while since I've done a post about books. Previously I was interning at Live Magazine, and the experience was amazing. Interning at Live Magazine is a book lover/hoarder's dream as they have a mini-library, filled with books which you're welcome to borrow (and sometimes keep). As a major book fan, you can rest assured that I am making full use of this policy, ha! 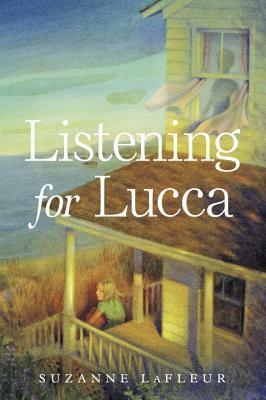 I came across 'Listening for Lucca' whilst on my lunch break, and haven't been able to put it down since. This story is told in a series of flashback from the point of view of Sienna who is the main character and WWII survivors. Sienna's 2 year old brother Lucca is another main character, who doesn't say much in the book, as he stopped talking at the age of 2.5 for no apparent reason. When the family relocates from Brooklyn to Maine, Sienna can't shake the feeling that houses is eerily familiar. Sienna has a sixth-sense ability, and when she starts having revelations and insights about the house and its former occupants, she realises their life story seems to that echo her own, and that's when this story becomes even more interesting! I won't say anymore than that as I hate reading book reviews that give the whole story away. This book is a definite page turner, and whilst I'm not usually into mysteries, I loved every minute of reading this one. Have any of you read this book, or any other books from Suzanne LaFleur- if so what are your thoughts? If not, what are you guys currently reading at the moment? Have any of you get a Summer Must Read List, that you'd like to share- if so, let me know in the comments section below?? FYI I'd give this book a 4/5.